This entry was posted in Comments about Cycling on May 30, 2016 by Steve Tilford. I raced The Growler MTB race in Gunnison yesterday. I don’t have enough energy to recap that right now, so I thought I would post about the promoter, Dave Wiens. The race was a blast. I decided the last minute to do this event. Vincent was doing it, so I texted my friend, Dave Wiens, who I knew would know about the race. It turns out that Dave is pretty much the race. At least the go-to guy. I know races like The Growler takes a huge group effort. I think I first met Dave back in 1990. That was the first year that I kind of really raced MTB professionally. I think Dave was riding already for Diamondback. I went to Race in the Sage and I distinctly remember Dave racing in high black socks, on the road. He should be credited for breaking the trend of white socks only. Plus the sock height. He never wavered on this, even though it took cycling nearly a decade to catch up with him. At the criterium, he was all over the place. I’m not sure that he had ever raced a criterium. I couldn’t understand how a guy that was so good handling a MTB could be so green on a road bike. Most everyone else in the race had raced on the road before coming to MTB racing. It was peculiar that he started off-road. At least it was then. Dave was, and still is, a true-born mountain bike racer. He lives the lifestyle and is beyond passionate. He is the nicest guy with always something positive to say. I remember the World Championships in Italy one year. I had no idea how I had finished and found the results and was super surprised that I finished in the top 20. I had started dead last, 150 guys back, because of flatting twice in the qualifying race. I never knew I had passed enough guys to get an okay result. Looking at the results, Dave was way back, like in the 60’s maybe 80’s. I believe he was US National Champion that year. I saw him and asked him what happened. He said he just had a bad day. I asked him why he didn’t just quit and he said something that I practiced, but had never articulated. He said that he kicks these guys asses all year, all over the world, and that it wouldn’t be fair if he just quit. He said that the other riders deserved to beat him when he was having a bad day. That is true. My mantra is I don’t quit a race unless I’m sick or hurt. KInd of the same thought, but he said it way better. Dave won Leadville 5 times or so. We were inaugurated into the MTB Hall of Fame together in 2000. We didn’t know that we had to do acceptance speeches. Ned was introducing me and Daryl Price was doing it for Dave. They told us about 20 minutes before the event that all four of us had to speak in front of all our peers. Daryl amazingly scored a bottle wine that we shared, to take the edge off. Anyway, in my speech, I used Dave as an example of what a MTB racer is. A guy that appreciates everything involved in the sport. 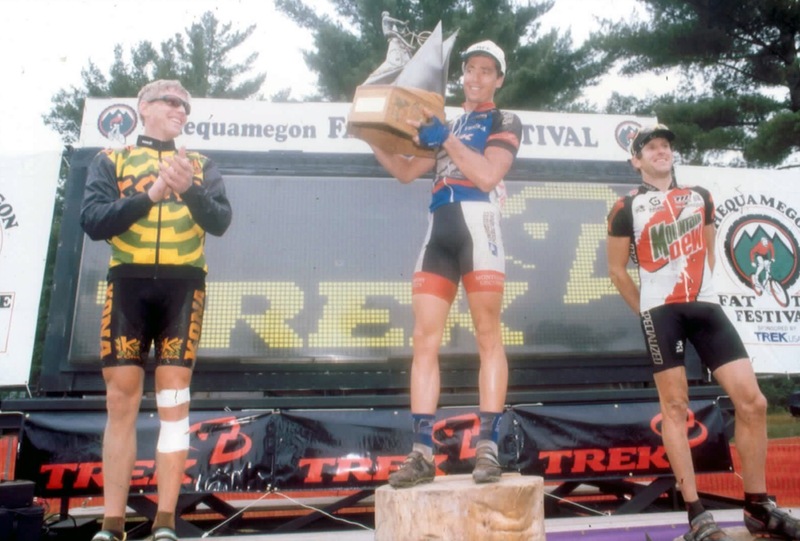 I told a story of the first time I raced Chequamegon. Dave came and was then flying to the World Championships right after. Marty Jemison, who was riding for the USPS, dropped all of us pretty early. I hung with him the longest, but eventually got popped. I was riding on Phipps Fire Lane and Dave comes riding up. He says something about how crazy strong Jemison is. Then proceeds to kill me. RIding on the first section of Birkie Trail, I could barely stay on. After OO, we were told that we were only 40 seconds back. When we got on Bodecker, we could see Marty behind the motorcycle. I started pulling we were going hard. There was a steep sandy descent that went down to the lakes. It has since been removed. We were hauling down this, nearly, singletrack descent and next thing I know, Dave’s rear wheel is pretty much in my face. He was going over the bars and I was plowing into him from behind. I hit him and flipped over and tumbled down the hill. I was maybe ten meters below Dave and couldn’t really see anything because I had so much sand in my eyes. I looked up and Dave was on his hands and knees, gasping for air. He had landed on his back and all the air got knocked out of his lungs. I got up and went back up to help him. Eventually he got breathing normally and I went down and got my bike and found my sunglasses. Dave was messing with something I told him I was going to get going. He said he’d catch up and that he was fine. I started riding along, pretty slowly, not really able to breath. My upper back was killing me. I just kept riding slow and Dave never came. I was a mile or so up the trail and thought that I should turn back around and go see if Dave was okay. I figured someone else had came upon him, but still was worried. Eventually Dave came riding up, all happy. I asked him why it took him so long and he said that he started off and then realized that he didn’t have the stick that had flipped into his front wheel to cause the crash. He said that he had a little shrine or something in his basement that he kept the important memories of his adventures and that the stick had a place there. I thought it was nuts. Dave just went back to the front and started pulling again. We were still racing for 2nd. When we got to the Seeley Fire Tower climb, the last real place to make a selection, I was hoping that Dave was going to just ride away from me. I was feeling badly that I was going to beat him when he pulled virtually the whole race. He didn’t and I started stressing. Luckily for me, I flatted on the last section of the Birkie Trail. It really was a relief. I would have hated out sprinting him under those circumstances. I ended up breaking 3 ribs. The next day, I went over to the Sunday fun day events at Telemark and Dave was there. He had already done the bike orienteering event, the log pull and all the other events that no other serious bike racer would have even considered. He was digging it. Remember, he was flying over to Europe to race the World Championships the next day. I remember envying him, thinking about how different our mentalities were at that time. I would have already moved onto the Worlds and he was living in the moment then. Dave finished super good at the Worlds that year. I’m not exactly sure, but maybe 12th or so. I think he was the best American rider. Drugs had already infiltrated the MTB scene, so 12th would have been an incredible result. Anyway, I was stoked to see Dave this weekend. He was out on the course, at a feed station on my 2nd lap, then at the finish. I talked to him a little after the race and he is the same passionate guy. Just as passionate about putting on a super race that supports local trail development as he was racing. The sport could use a lot more Dave Wiens. The world, in general, could use more guys like him. Dave and I after the race yesterday. Dave all bandaged up on the podium after the race. 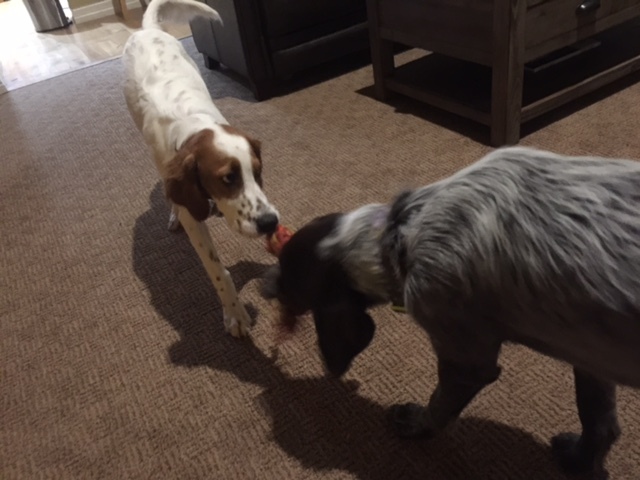 Tucker and Nikola play tug-of-war all day now. I’ve been reading this blog for years and that is as genuine a smile as I’ve seen on Steve in any post. Dave…and the Growler will do that for you. Dave is a class act, we need more people like him not only in mountain biking but in life. I met him at Leadville and he was very kind and humble. This is about as good as the internet gets. I’m glad a friend brought this post to my attention. Winning Chequmageon was truly memorable to me. It was freedom away from the Professional peloton and my duties there. After finishing the Tour de France your able to turn 2-3 cogs with the same perceived effort. Greg Lemond may have led out the race that year (I’ve won the race twice) and I have always admired his career. He told me to hold on to his wheel and we were glued to the 4-wheeler until it pulled aside. It didn’t take long before I was alone. 40 miles of mostly fire roads was/is perfect for me. If there was any more technical riding the mountain bike Pro’s would have shined. That said I buried myself and have a great memory because of it. *wimning the 2nd time with Rishi Grewal glued to my wheel was much harder!!! I tend to ride alone unless I’m leading a cycling tour in Europe. Skitown – It is nearly impossible getting through with that much incredible singletrack and not have a smile on your face. The trail system around Gunnison is incredible. Met Dave Weins on an “urban assault” mountain bike shop ride throughout Atlanta during the 1996 Olympics when he was riding for Kona. One of the most memorable rides of my life. He was such a genuine guy. We were initially all enamored that here we were riding with a pro, but within five minutes I realized that he was just doing what he loved and just wanted to hang out. He wasn’t there to show off, he was there to have fun. A few days latter he was running around the MTB course as his future wife Susan Demattei was ripping It up on her way to a bronze medal. Have loved to see that someone like him has stayed in the sport, and agree we all need more Dave Weins in the cycling world. Thanks for your kind words, Steve, they mean a lot to me. I have a ton of great memories of racing and hanging out with you, but certainly, our crash at Chequamegon was a highlight! I’ll look around for that root ball, it was pretty neat. Wedged into the spokes of my front wheel and stopped it cold. 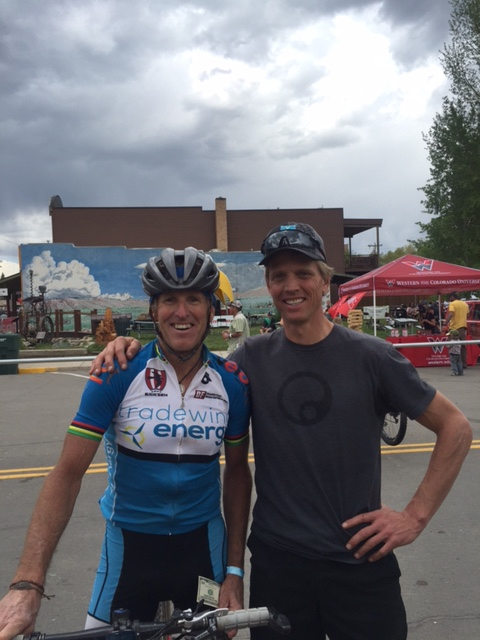 And thanks for coming to Gunnison and racing the Growler, it was great to see you! Weiner is tops! I too met him around the same time as you Tilly, and both he and his wife are among our favorite people we have met in the sport of the mtb scene. We have kept in touch with them over the years, visited Gunnision, and enjoyed their company. Dave is truly, as you state, an ambassador of the sport and a true pioneer of spreading the grass-roots aspect of riding/racing. He is a gem to work with from my years in the industry and I am proud to call him my pal. I think that was my second Chequamegon. My roommate and I raced Tandem Class. Those downhills were so much fun on a freight train! Last summer, I was with a group of people set up with my coach Ryan Kohler and another coach, that split us up into two groups – Ryan took the stronger group, and I with the not as fast group. Then my group split up and I ended up riding with Dave alone. We rode a lot of the course, Dave was giving great tips and helping me along the way. When we were finished, one of the women in the group asked Dave to sign her bike, I was thinking who is this guy for someone to do that? I had NO idea that it was THE Dave W, and even then, didn’t know of his legendary status until I got back and looked him up. I am fairly new to the sport, so big names I am not familiar with. The following week at the race, he remembered me, encouraged me, even saw me on the course and cheered me on – relatively speaking, I am a nobody, just a ‘weekend warrior’ that fell in love with MTB racing a few years ago. The Growler is his baby, and it shows, so well run, volunteers are great, communication, everything, even the right amount of pain and suffering – to keep it honest and a ‘real’ mountain bike race. I was so honored to ride and meet him, he is what everyone says and more. Thank you Dave, for making that year, and I did come back and race this year again, such a great experience!